Patients with early leukemia may not feel any discomfort and they often cannot identify the symptoms of its different types, thus many of them miss the optimum time for treatment. So what are the symptoms for each type of leukemia? 1. In the early stages of chronic leukemia, symptoms may not appear for a long time, thus the patients cannot feel any discomfort. Doctors will usually find abnormal blood picture or splenomegaly (enlarged spleen) during a routine checkup or examinations for other diseases and then the patients are diagnosed with chronic leukemia. 2. When symptoms do appear, they are generally mild at first and progress gradually. Common symptoms of chronic leukemia may include: fatigue, low heat, excessive sweat or night sweats, weight loss for unknown reason, and hyperthyroidism, in addition, left upper abdominal distension and sensation of fullness after eating (due to enlarged spleen). 3. Patients with chronic leukemia often manifest as pale complexion, pale lips, and splenomegaly which is the most obvious symptom and which often has reached umbilical plane when patients visit a doctor, furthermore, tenderness in the lower part of sternum. Patients with advanced chronic leukemia will appear tiny red spots under the skin, mucous, and painless mass in the tissues of eye sockets and skull. 1. Anemia: hematopoietic abnormalities of bone marrow leads to low number of both red blood cells and hemoglobin, thus anemia will be developed and half of the patients can develop severe anemia. 2. Fever: leukemia itself can cause fever, furthermore, due to decreased immunity, once pathogens invading body, thus it tends to cause infection and results in fever. 3. Bleeding: due to stasis and infiltration of the large number of leukemia cells in blood vessels, low number of platelets, coagulation abnormalities and infection, patients will appear scattered red spots, purpura or petechia from head to foot, nosebleed, gingival bleeding or excessive menstruation, furthermore, blurred vision resulting from fundus hemorrhage, coma and even death due to intracranial hemorrhage can be caused. 4. Gastrointestinal failure: it can result from agents used in chemotherapy and radiation therapy which will affect gastrointestinal function. 5. Hyperuricemia: it can be caused by chemotherapy, radiotherapy and application of cortical hormone, what’s more, with high concentration of uric acid supersaturated soon and precipitated, oliguria and anuria will be caused by extensive damage of kidney and the formation of uric acid stones. Symptoms of early leukemia in Children are pale complexion, fatigue, lassitude, loss of appetite, nasal bleeding or bleeding gums, etc. ; few patients firstly manifest as fever and bone joint pain which is similar to rheumatic fever. 1. Anemia: it appears early and aggravates progressively, besides, it manifests as pale complexion, weakness, shortness of breath after activity, and tachycardia (too fast heartbeat). 2. Fever: it often occurs with uncertain types and mostly is irregular fever with no shivering. Leukemia fevers mostly manifest as low heat and antibiotic treatment is ineffective; secondary infections (respiratory tract infections, urinary tract infection, etc.) mostly are high heat. 3. 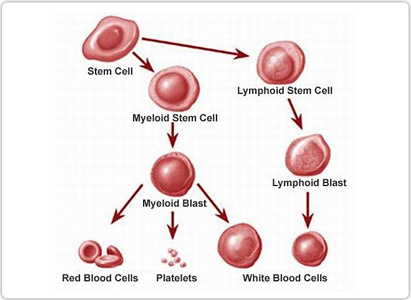 Bleeding: main reasons of bleeding are firstly, leukemia cell infiltration thus bone marrow megakaryocyte will be inhibited, causing low number of platelet; secondly, impaired liver function causes insufficient production of fibrinogen, thrombinogen and accelerin; thirdly, capillary permeability increases. Most of bleeding occurs in the skin and mucous membrane, manifesting as purpura, petechia, nosebleed, gingival bleeding, gastrointestinal hemorrhage and hematuria, in addition, occasionally intracranial hemorrhage which is one of the important causes of death. To know and identify the symptoms of leukemia can help patients detect it early and then get treatment in time.